Gandy and Roberts Consulting Engineers was first established by Jim Gandy and Clive Roberts in 1985. Following Clive's retirement in 2002, David Visentin and Adam Richards were appointed as directors. Jim moved from his position as a director to a consultancy role in 2008, and Richard Lawrence and Colin Terry joined the management team. 2016 saw some role restructuring, with Owen de la Motte's appointment as director and Colin's relocation overseas. Klaus Stroehl joined the team of directors in 2018 to grow and establish Gandy and Roberts’ BIM business. The five working directors bring a diverse range of past experiences to a common desire to work closely with our clients, project team and contractors to deliver memorable projects. The company is wholly owned by the directors, who are working structural and civil engineers and continue to be directly involved in project design and management. David has been with Gandy and Roberts since 1994 and a director since 2001. From an early stage, he has worked on many of the largest of Gandy & Roberts projects as lead designer and project coordinator. His career has been underscored by integrity, hard work and a collaborative approach to problem solving. David has developed an innate ability to evaluate the core issues of a problem that enables him to effectively critique designs, providing high level review of ideas in the conceptual stage of a project. David’s tenacity and belief in providing the client with the best possible result has allowed him to save millions of dollars in construction cost on over budget projects by challenging the design decisions made by planners, architects and other engineers. This is an asset that all who work with him appreciate. After joining Gandy & Roberts in 1995, Adam moved overseas in 1999 to pursue opportunities in the UK. Whilst in London he worked on a number of high profile buildings including The Bullring in Birmingham whilst with The Waterman Partnership, and The World Trade Centre in London with Upton McGougan. He became a director in 2002 after returning to Hobart with a greater appreciation for the freedom of design and creative ideas that exist at Gandy & Roberts. Having always been interested in the way technology can help to visualise and communicate engineering solutions, Adam is actively working on expanding Gandy & Roberts’ BIM capability to offer BIM Coordination and BIM Construction services to the AEC Industry as specialist disciplines. Through recognition that coordination of building documentation is a discipline in its own right, the aim of this enterprise is to use BIM technologies collaboratively with project partners to deliver a fully coordinated model which can also be used by the builder and the building owner as a foundation for a construction and/or facility management model. Richard started his engineering career at Gandy and Roberts in 1993, while still a student at university. He went on to gain valuable experience working interstate and overseas in Western Australia and the UK. He has worked on many projects in Asia, including the Grand Legenda (a high rise casino development which was built in a seismic zone in Subic Bay in the Philippines) during his time in Western Australia and spent two years with Upton McGougan in London. Richard returned to Hobart in 2003 with a renewed appreciation for the specialist skills and innovative thinking within Gandy and Roberts. He has been a Director of the company since 2008. Richard’s interests lie with challenging projects and whilst he has extensive experience in concrete design, he most enjoys distilling complex steel and timber structures into simple forms which achieve the architect’s brief through innovative, economical design and simple detailing. Particular examples include the Burnie Maker’s Workshop, the Tarremah School Hall and the Friends School Assembly Hall. Some projects Richard has been recently involved in are the Brooke Street Pier Ferry Terminal ($12M budget), the Blundstone Arena Western Stand ($30M budget), Mona Pharos, UTAS Melville Street Student Accommodation and the Huon Aquaculture On Growing Facility. Richard draws satisfaction from diversity in projects, irrespective of scale and is not afraid to explore new construction techniques. Owen joined Gandy and Roberts in 2007 as a design engineer after working in local government and hydraulic modelling. Branching into structures, he quickly developed the skills and enthusiasm to produce efficient and practical designs. Leading a team of structural, civil & hydraulic engineers, designers and technical officers on a wide variety of challenging projects is his forte. Complementing the design role, Owen has a wealth of construction supervision experience. Becoming a director of Gandy and Roberts in 2016, Owen continues his particular interest in pre-stressed concrete structures. 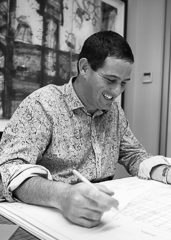 Owen has been the lead designer on award winning residential projects, office, health & aged care, education and multi-residential projects. Working extensively in retail developments in recent years, his expertise also extends to forensic investigation, reporting, and remedial works to existing structures. Owen derives satisfaction from working with clients, architects, designers and contractors to help deliver successful projects both large and small. Recently, Owen has had an influential role on the design and implementation of the Icon Development for Kalis Properties ($100M budget), the Cat and Fiddle Retail Centre Redevelopment ($20M budget), Avalon City Retreat and the Launceston Integrated Care Centre. Born and raised in Frankfurt (Germany), Klaus is a fierce advocate to improve construction processes through the implementation of BIM (Building Information Modelling). He believes that BIM and associated technologies is the key to realise productivity gains in the construction industry. Klaus was introduced to model-based design and production processes during his joinery apprenticeship in Germany. This allowed a higher degree of pre-fabrication and client confidence as well as reduction of on-site labour and improved product quality. Following further study and an engineering degree, Klaus discovered BIM whilst working as a structural engineer for a multi-discipline consultancy in Brunswick (Germany), and quickly recognised the enormous potential it contains to advance traditional design/documentation/construction processes. After relocating to Hobart in 2013, he took on the role of Technical Consultant for Revit and BIM processes at A2K Technologies (which involved setup and implementation of Revit and BIM processes in many architecture, engineering and construction practices across Australia), before joining the Gandy & Roberts team as BIM manager in 2016 and company director in 2018. After practicing BIM for over 10 years, Klaus remains confident that it provides exceptional opportunities on all projects for all project stakeholders. In contrast, poor implementation of BIM will inevitably end up in frustration and failure to deliver its promises. Success requires commitment, skilled project partners, a tailored strategy for each project and a dedicated BIM team. His current role involves establishing BIM Consulting at Gandy & Roberts as a discipline in its own right, and to establish client confidence in our ability to deliver on the BIM promise. Klaus latest project involvements in Tasmania include managing the design team’s BIM deliveries on a MONA museum extension project “MONA Solstice”, the $96M UTAS project “THE HEDBERG” and a state-of-the-art Salmon grow-out Facility in Port Huon. Jim enjoys taking an architectural vision and turning it into a logical structure that can be built, but still retains the original design intent. Jim’s recent catalogue of work includes the impressive Saffire Freycinet Resort, the IXL Atrium and the Forestry Tasmania Centre, all of which illustrate his talents. He also loves a big shed. One of the founding directors of Gandy and Roberts, Jim is highly regarded in engineering and architectural circles in Tasmania. He is the only engineer ever to have been awarded the prestigious President’s Prize by the Australian Institute of Architects. Jim continues his work with the company as a consultant. Over the past forty years, Jim has helped bring to life some of Tasmania’s most recognisable architectural structures. He is renowned for his ability to work with architects and builders to find innovative, yet practical, engineering solutions.